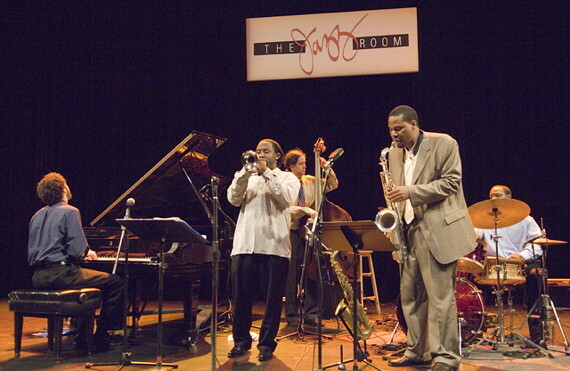 Part of the William Paterson University Department of Music, the Jazz Studies Program is unique among college programs. It is one of the few in the country with real emphasis on small-group playing and a genuine commitment to the jazz tradition. Its artist/teacher faculty is made up of world-class New York area professionals and is second to none. The Program is a true jazz environment in which students learn firsthand about the jazz world and the requirements for becoming a successful professional musician. In addition to being musically talented, the student who enters the William Paterson Jazz Major Program is highly motivated, independent and, above all, flexible. William Paterson Jazz Majors come from all parts of the United States and all corners of the world. Many talented first-year students come from high schools across the United States; transfer applications are also welcome from students currently enrolled in other colleges or conservatories. Many Jazz Studies majors choose to live on campus. William Paterson University is located in Wayne, New Jersey, 20 miles west of New York City on a 250-acre wooded suburban hilltop campus. Full dormitory residence and recreational facilities are provided. Internationally acclaimed, 4-year program with an intense emphasis on improvisation and small jazz group performance. Jazz performance with a concentration in Music Education leading to teacher certification. Jazz performance with a concentration in the music business--New York internships available. Jazz performance with a concentration in Sound Engineering Arts. Jazz performance with a concentration in [Classical] Performance. Duos, trios, quintets, sextets, Big Band, Latin Band, Repertory Band, VocalWorkshop, Vocal Lab. Focus on improvisation, learning of repertoire and group performance techniques. Each jazz major performs in a minimum of two ensembles each semester. Veteran New York musicians with international reputations as performers, recording artists, arrangers and conductors: in residence, accessible and dedicated to teaching. Jazz Program enrollment is limited to sixty select students, allowing for individualized instruction and a close rapport between students and faculty. Affordable in-state and out-of- state tuition. 250-acre suburban hilltop campus located 20 miles west of New York City. Full on-campus residential and recreational facilities. Jazz majors perform in four weekly ensemble rehearsals. Student groups are featured as opening for professional jazz artists in WPC's renowned Jazz Room Concert Series, in the College's Midday Recital Series and in a number of area jazz clubs. All jazz majors have private instrument/ vocal study with William Paterson's respected resident and adjunct faculty. Students benefit from challenging, full-course sequences in improvisation, ear training, jazz history and analysis, small group and big band arranging, piano and comprehensive musicianship. Twice each semester student small groups play for the jazz faculty and for each other. After each performance, a member of the Jazz faculty moderates an open-ended critique, ranging from the technical to the philosophical aspects of the performance. Shea Center for Performing Arts, which houses the Department of Music, contains a 960-seat auditorium, an 85-seat recital hall, and a multitrack recording studio. The David and Lorraine Cheng Library holds a large and well-organized jazz album, CD and video collection, as well as numerous books, periodical and reference collections relating to jazz. A recital hall and large ensemble rehearsal room are currently under construction. All student performances are recorded by students and faculty of the Sound Engineering Arts program. The world-renowned Vanguard Jazz Orchestra is in permanent residence at William Paterson University. Students benefit from annual concerts, clinics and workshops with VJO members. Guest lecturers include Clark Terry, Dr. Billy Taylor, Freddie Hubbard, Pat Metheny, Joe Lovano, Bob Mintzer, Kenny Werner, Steve Lacy, Ray Brown, Hal Galper, Lewis Porter, Jeri Brown, and many others.